During the Argentinian Dictatorship (1976-83) grandmothers and mothers would protest the forced disappearance of their children and loved by ones by wearing lockets of their faces in the streets. This simply gestures reflects the often female, delicate and intimate methods of protest during this dark period of Argentinian history. 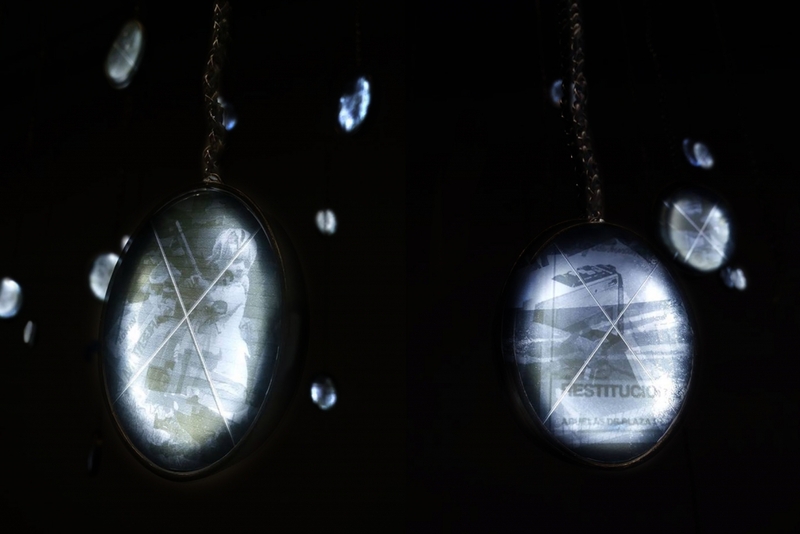 This installation, re-images the original acts of protests in lockets that are suspended from the ceiling each acting as small light boxes. This installation is part of a larger project by the artist, Stephanie Mercedes, entitled “Luz del Día: Copyrighting the Light of Day” in which the artist is combating pending copyright legislation that would make the photographic archives of the Argentinian Dictatorship inaccessible to the public. About the Artist: Through radical justice, investigating copyright law, and film photography, Stephanie Mercedes hopes to restore missing violent histories, turning the archive into legend. Mercedes has a research-based practice that intersects law and social justice. Her recent work is in connection to the history of the Argentine dictatorship (1976 – 1983). By building publicly accessible photographic archives, Mercedes hopes to restore silenced voices. Mercedes’ work questions the purity of the documentary image, the singularity of memory, and the purpose of the archive. Mercedes is an Argentinian/American Artist whose practice moves between Performance, Social Practice and Social Sculpture. In 2017 Mercedes won the Light Work Grant and the Open Society Grant for documentary images. She has exhibited at the Bronx Museum of Art, Flux Factory, Paco das Artes and many institutions across the Americas. She was the VisArts Studio Fellow from January – June 2018 where she used her studio as a platform for investigations into the ethics of violent images, art and law, and Latina performance, Mercedes is always looking for individiuals who want to share their connections to the histories she excavates.